Privately held Greensmith, a provider of software for grid-scale energy storage, just closed an "oversubscribed" $12.3 million round of funding with help from venture investors and $5 million from utility behemoth AEP. That brings Greensmith's investment total to about $20 million. GTM Research's Senior Storage Analyst Ravi Manghani notes, "​This marks a shift in ​AEP's energy storage strategy. It's also the first major storage activity at AEP since the community energy storage (CES) pilots in Ohio. AEP was one of the first utilities to explore energy storage in the mid-2000s. Its strategy was focused on CES deployed closer to load centers that would provide AEP several grid and local benefits. Greensmith offers AEP an actionable path to monetize the various distribution-level benefits using its software platform. In that sense, it will be interesting to see if it continues to pursue 100-kilowatt scale CES projects with Greensmith's technology platform, or move further upstream with megawatt-scale projects." In addition to AEP and another undisclosed strategic, Greensmith has received funding from VC firms Cota Capital and Maryland's own TDF Ventures. CEO John Jung told GTM this afternoon, "We don't need a lot of capital." According to the CEO, the Rockville, Maryland-based startup’s software manages more than one-third of the 62 megawatts of energy storage projects deployed in the U.S. as of 2014. Those projects range from a 20-megawatt system providing frequency regulation for grid operator PJM to 30-kilowatt behind-the-meter batteries in California, along with newer projects balancing intermittent solar power in Hawaii and Puerto Rico. Its most recent partner is Duke Energy, which announced that it’s tapping Greensmith for a 2-megawatt storage project featuring lithium-ion batteries from LG Chem. Greensmith has incorporated a dozen different types of batteries, including multiple lithium-ion chemistries, as well as Aquion Energy's sodium-ion battery and ViZn Energy’s zinc redox flow batteries, into its software suite. Jung is a battery agnostic. About two-thirds of the company's customers are electric utilities, including San Diego Gas & Electric and Sacramento Municipal Utility District, according to the CEO, who said he wants as many stakeholders as possible "to take advantage of the software stack." Jung said, "Last year's growth was transformative for the company. 2015 is about viability and ROI delivered." He added, "At our core, we are a software developer with design and integration capability." Jung emphasized the benefit of building, interconnecting, and commissioning turnkey systems: "If you don't understand the technology involved or understand the grid interconnection -- then you don't really understand how to build storage-system software." Greensmith is providing its software for about 45 projects with 20 different customers, and has nearly 500 megawatts of projects in a pipeline that “is growing on a weekly basis,” Jung said in a previous interview. But the company has also done several behind-the-meter projects, including two 1-megawatt battery systems, one in Puerto Rico and another in Ohio, according to Jung. These are much bigger projects than the typical behind-the-meter battery systems being installed in buildings by companies like Stem, Sunverge, Green Charge Networks and Coda Energy or Tesla and SolarCity. The projects are not just aimed at providing demand-charge reduction for customers’ utility bills, a revenue stream with an "anemic ROI," according to the CEO. Instead, “some of these customer-sited systems are participating in frequency regulation,” he said, while the Puerto Rico project is specifically aimed at meeting the smoothing and ramp-control requirements for new solar and wind projects being built on the island. 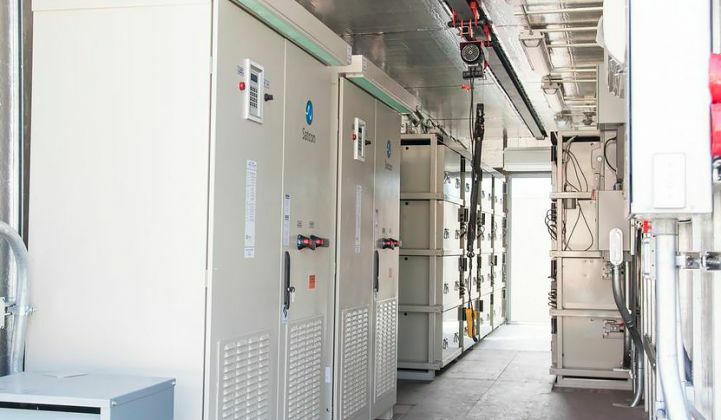 GTM Research predicts the U.S. will deploy 220 megawatts of energy storage in 2015, with the market on a path to reach 861 megawatts of annual installations and a value of $1.5 billion in 2019. 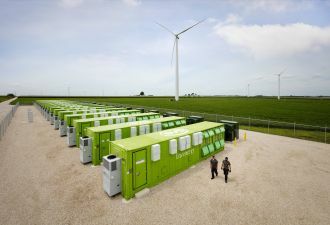 Meanwhile, energy-storage companies have won about $112 million in investment so far this year, with about $40 million going to energy storage management providers Greensmith, Advanced Microgrid Solutions and Stem. Other key energy storage management software providers include Geli and 1Energy. Key Greensmith competitor Younicos has reportedly raised about $200 million from backers including Samsung.